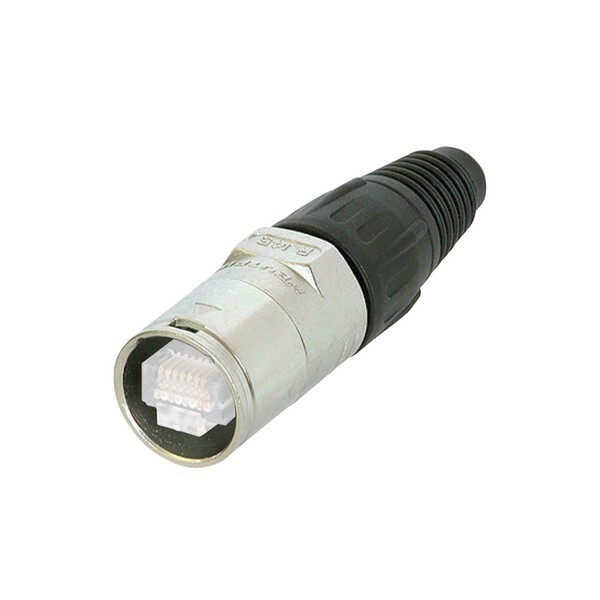 The Neutrik NE8MC-1 EtherCON RJ45 XLR-Style Cable Connector is the perfect carrier upgrade for conventional RJ45 plugs (RJ45 plug is not included with the NE8MC-1). This carrier consists of a robust die-cast shell, reliable fixing disk, unique chuck-type strain relief, and a revered X-Series polyurethane boot. The NE8MC-1 is ideal for use in harsh and demanding environments, with the potential to achieve IP54 water protection when used in conjuction with an SE8FD sealing kit (available separately). This robust and lockable solution is designed to prevent breakage of the fragile components in standard RJ45 connectors, providing exceptional protection within a variety of commercial applications. Please refer to the downloadable PDF for a list of compatible RJ45 connectors. Please Note: This connector does not include an RJ45 plug. The RJ45 cable assembly must be acquired separately.